Discover the roots of the modern world in an exciting new multi-disciplinary way. Examine the development of ancient thought from antiquity to the present. Explore the art and architecture of the Graeco-Roman era. Understand and appreciate languages and cultures of long-lost civilizations. These opportunities and more are available to you when you choose to major in Classical, Medieval & Renaissance Studies at the University of Saskatchewan. What is Classical, Medieval & Renaissance Studies? The Classical, Medieval & Renaissance Studies program examines the origin and evolution of western civilization between 700 B.C. and A.D. 1600. An understanding of civilization requires the integration of three dimensions: the historical (including archaeology and the history of society and politics); the intellectual (including philosophy, science, and religion); and the cultural (including languages, arts, drama, literature, and architecture). This integration of humanities disciplines makes Classical, Medieval & Renaissance studies both distinctive and exciting. Students concentrate on one of the three streams (historical, intellectual, or cultural). They supplement this with work in the other two streams, language study, and a wide range of electives from archaeology to philosophy, gender history to music, literature to drama. This interdisciplinary approach provides students with a rich understanding of this period and a well rounded training in the humanities. The program draws on the intellectual resources of nine departments and St. Thomas More College. Classical, Medieval & Renaissance studies offers a distinctive approach and an exciting selection of courses. 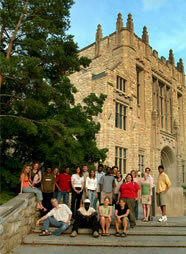 It also boasts a fertile, engaging, and student-focused academic community. On a monthly basis, the faculty and students meet for discussion and to hear a talk by a faculty member or visiting scholar. Here students have a chance to learn about, and directly participate in, the scholarly world.